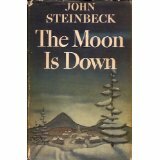 Steinbeck’s #” The Moon is Down” is a must read for anyone who has an interest in the World War II Nazi occupation of towns in countries like Norway, Italy and France. Steinbeck wrote this novel in response to the U.S. government’s request that he write a propaganda novel. He set his story in a fictitious city invaded by an unnamed enemy. Clearly his invaders were Germans. Steinbeck explored the occupation from the perspectives of both the invaders and the invaded. The result is an in-depth examination of the psychological and emotional impact enemy occupation has on all people involved. The book was an instant hit in Europe and purportedly aided the healing process after the end of the war because the victims believed Steinbeck expressed the true agony of occupation. Though written in the 1942, “The Moon is Down” is written in an ageless style that will suit modern-day tastes. I love Steinbeck, but I have not read this one. Thanks to you suggestion I will definitely look for it. I love reading about the WWII period, and set my book “Lydia’s Story” in that time period. Thanks again for bringing “The Moon is Down” to my attention. Lydia’s Story sounds interesting. Does it take place in an occupied city? I’ll be honest and say the book holds no appeal for me. But I expect that there are many readers who would be interested in the topic, especially by Steinbeck. The book is a bit different than Steinbeck’s typical subject choices. My son found a first edition of this book at a garage sale and gave it to me to add to my collection. It is very different from other books by Steinbeck. Images from parts of the book are vivid in my mind long after reading it. The images in Steinbeck’s book impacted me in the same way they did you. I could not put the book down and I still think about it. How exciting that you son found a first edition. I think it’s a treasure and worth a considerable amount of money. Thanks for sharing your thoughts about the book. I’m curious about your comment that this book, “purportedly aided the healing process after the end of the war because the victims believed Steinbeck expressed the true agony of occupation.” I’ve never read that before and would be grateful to learn where you came across references to it. Thanks! Thank you for the link to that fine discussion of the American reception of Steinbeck’s book. It does not, however, discuss the book having aided the healing process after the War. Do you have a citation or link for that? It has taken me some time to relocate my research sites, but here are a couple of my reference urls. I hope these are helpful. I’m so sorry I can’t be of more help. I will keep searching for the citation link as I do my postings. I hope I can find it for you. Many thanks for digging those up! The Forster review article is only available in part online, but that doesn’t mention the book having aided the healing process after the War. I will track it down. The ClassicIt site is just a summary of the book with no research content. I’ve been working on The Moon Is Down for some time and have never come across a mention of the book having aided the healing process after the War. I’m pretty certain Coers makes no mention of this. I wish it were true, but I fear most Europeans were exhausted by war and still rather angry with the Germans – Nazis or otherwise – for having ravaged the continent. If you have any other information on this I would be most grateful. If not, thank you for an intriguing thread to follow. It’s so interesting that you’re researching The Moon is Down. Did you read the section in which the book was used by resistance groups? How about the section in which the King of Norway awarded Steinbeck for his work. In my research I gleaned that Northern Europeans in occupied towns and villages believed Steinbeck demonstrated understanding of what they were going through. I wonder if there wasn’t some small satisfaction to know that Steinbeck saw that the occupiers may have suffered from the resistance efforts of the occupied villages�some feeling that the resistance effort did something. Of course, no one forgives the Nazis for what they did. It was and will always be unforgivable.